The cast of characters has changed since the Storm last held up the WNBA championship trophy, and there were many heroes in this 2018 title chase. 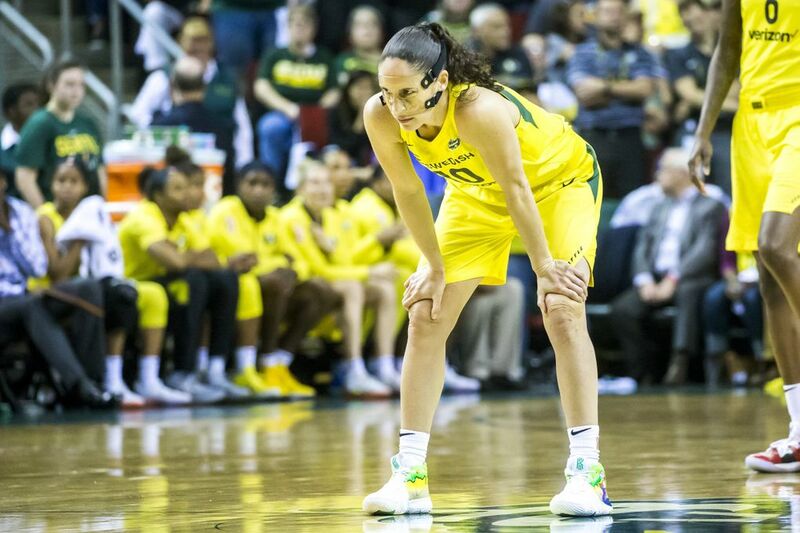 But above all, Sue Bird is the Storm's rock, and she cemented her legend with title No. 3. Déjà vu, and champagne, all over again. Bird was a linchpin in 2004, when the Storm took their first title, and a stalwart in 2010, when they won again. And now, 14 years after the initial celebration, Bird is the heart and soul of yet another Seattle team that hugged and mugged and savored the trappings of ultimate victory. “On the court, off the court, honestly, Sue is at the center of why we’re here, again,’’ the Storm’s president and general manager, Alisha Valavanis, told ESPN’s Holly Rowe as the Storm received a new trophy to add to the bulging case. The Storm did it in style, completing a three-game sweep of the Washington Mystics on Wednesday with a 98-82 win in Fairfax, Virginia. They were pushed in the fourth quarter, when the Mystics rallied to within five with 6:40 to play. But as they have all series – all season – the Storm had the answers. The brilliant Breanna Stewart, arguably the best women’s basketball player in the world, hit a tough shot in traffic, was fouled, and completed the three-point play. Natasha Howard, the best player on the court on Wednesday, added a put-back, and Sami Whitcomb came off the bench to drain a three-pointer. 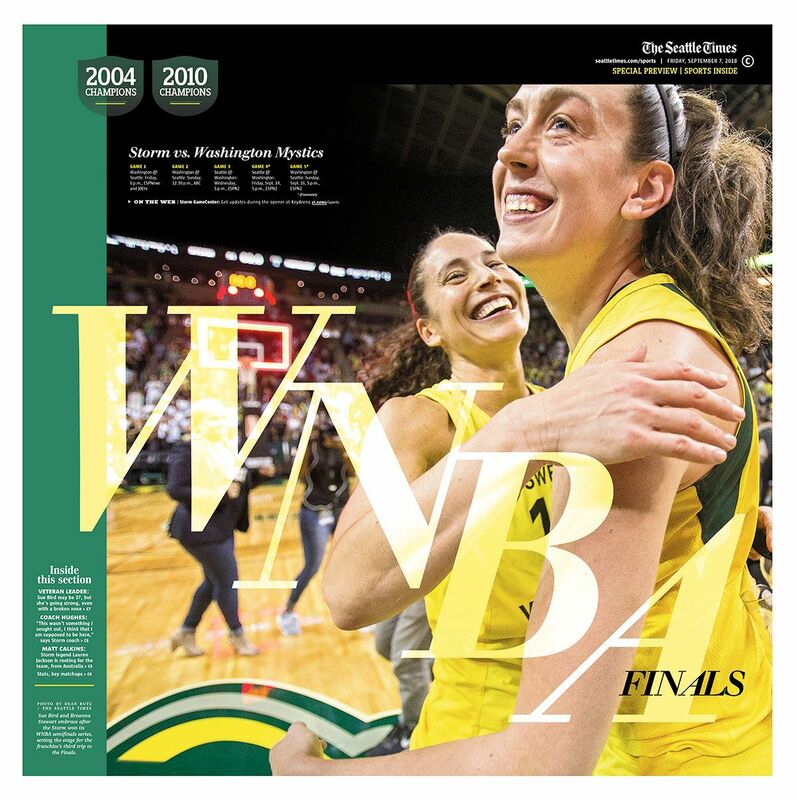 Stewart, the WNBA’s Most Valuable Player this season, added Finals MVP to her resume, which includes four NCAA titles at Connecticut, for which she was named the outstanding player in each of them. Stewart had stewed during her first two Storm seasons, unwilling to accept mediocrity after such a storied collegiate and Olympic career. She burned with the desire for similar prosperity in the pros, and made it happen. Stewart had 30 points, and Howard, who had been a bit player in Minnesota last year when the Lynx won the title, was a monumental contributor all year in Seattle after her acquisition in a trade. Howard capped her breakout season with 29 points (on 11 of 14 shooting) with a game-high 14 rebounds. Heroes abounded for the Storm. Alysha Clark has been the trigger of their suffocating defense all season, was again on Wednesday, and added 15 points in the clincher. Whitcomb was again a factor off the bench with six points, and Jewell Loyd, despite an off-shooting night (2-for-11, 0-for-3 on threes) still found a way to contribute with six assists and four rebounds. But everyone on the delirious Storm side may have been happiest for two people – first-year coach Dan Hughes, and the venerated veteran Bird. Hughes came out of retirement at age 63 for one more crack at a WNBA title, which had eluded him during 15 previous seasons coaching in San Antonio, Cleveland and Charlotte. Inheriting a team that had finished 15-19 and 16-18 the previous two years, but dripping with talent, he instilled a defensive mindset and placed his trust in the players. Then he watched them turn into the best team in the league during the season, and validate that status in the postseason. He had a vital accomplice in Bird, as a coach on the court, but still amazingly productive at age 37, who helped will the Storm back to prominence. It’s only fitting she closed out the season with a double-double. Bird scored 10 points (including the final two with under a minute to play) and dished out 10 assists, many on her patented no-look passes. The fact that she did it with a broken nose (the fifth of her career), wearing a plastic mask that was painfully poked in the third quarter, just added to the lore of one of the greatest athletes Seattle has ever seen. Bird dabbed away the blood and went right back out to steady the Storm through Washington’s fourth-quarter rally. Once, it was Bird and Lauren Jackson who powered this franchise to such great heights. Bird persevered through a long and at times painful rebuild after Jackson’s departure, gutted her way through a knee injury that cost her an entire season, determined to still be there when the good times returned. 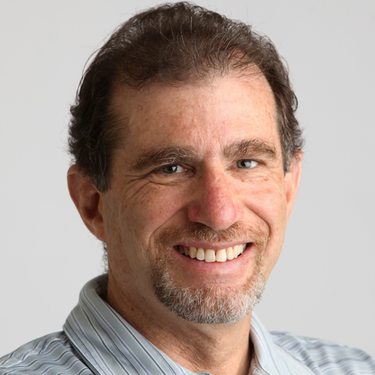 And now it is Bird and Stewart and Loyd and Howard and more, a new championship cast is Seattle. The nucleus is young and still hungry, except for Bird, who is, well, not so young, but still hungry. 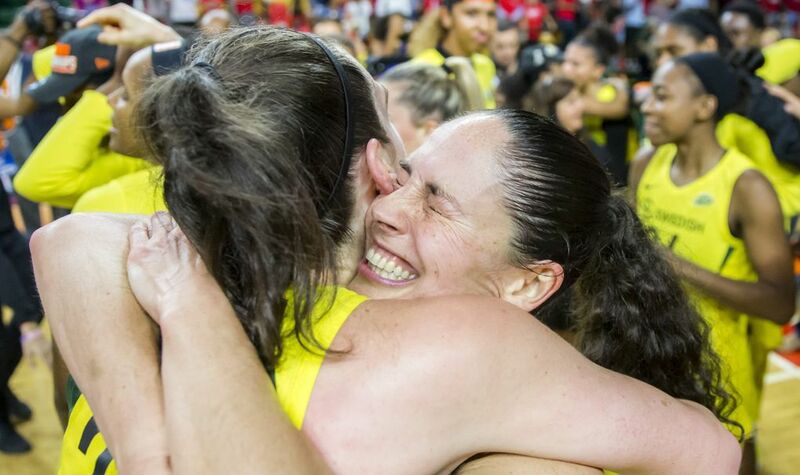 “It’s each one of them, to a player, starting with Sue Bird, but every single player is why we’re here,” Valavanis told Rowe. No need to analyze, Sue. It’s time to celebrate.